First of all, you need to connect your Facebook account to your WordPress website. Open the Account Settings to do so. First type in the name of your account. You will also see two other fields there- App ID and App Secret. 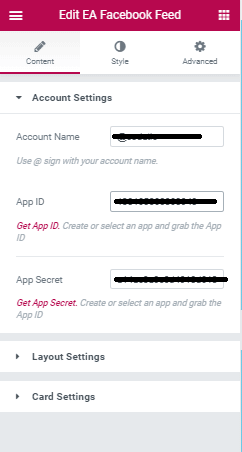 If you already have a Facebook Developer account then open Facebook App Dashboard and copy the APP ID and paste it into the App ID field. But, if you do not have a Facebook Developer ID click this link and follow the instructions. Similarly, insert the App Secret ID in the next field. Click on the links highlighted in red to get your APP ID and App Secret ID. From the Layout Settings first, pick a content layout style from the drop-down menu. Next, adjust the Columns, content length, post limit. If you want to display any media of a post-like the feature image for a blog-toggle on the Show Media Elements bar. Afterwards, from the Cards Settings, use the toggle bar to disable/enable Avatar, Show date, Show read more and show icon options. From the General Settings, pick a background color, adjust the margin, radius, and border for the element. From the content style option adjust the card layout in general. And not to mention, from the Color and Typography option, you can separately adjust the Title Style, Content Style, and Link style.